Precious metals futures were mixed Thursday with gold and platinum closing lower and silver and palladium ending higher. Gold has now declined for five straight sessions. Gold for April delivery dipped 20 cents to settle at $1,314.20 an ounce on the Comex division of the New York Mercantile Exchange. The yellow metal has seen pressure this week on strength of the U.S. dollar. "The exchange rate development is presumably the only reason why gold is falling just now, as gold in euros is holding its own relatively well at around €1,150. We believe that gold should remain in good demand — after all, the political risks appear to be increasing again," wrote analysts at Commerzbank, in a note according to MarketWatch. 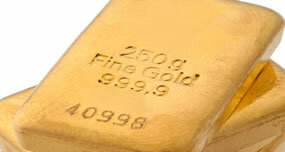 Gold futures ranged from a low of $1,306.40 to a high of $1,315.80. They lost 0.4% on Wednesday, inched down less than 0.1% on Tuesday and shed 0.2% on Monday. Last Thursday, they settled at their best price since April 24. Silver for March delivery rose 1.2 cents, or less than 0.1%, to settle at $15.713 an ounce. Silver futures traded between $15.63 and $15.75. They moved down 0.9% on Wednesday and fell 0.3% on both Tuesday and Monday. Last Thursday, they marked their best close since July 10. April platinum dropped $16.50, or 2%, to $797.30 an ounce, ranging from $796.70 to $810. Palladium for March added $6.50, or 0.5%, to $1,358.10 an ounce, trading between $1,338.90 and $1,367.80. Gold declined $2.40, or 0.2%, to $1,310 an ounce. Silver fell 2 cents, or 0.1%, to $15.71 an ounce.